The New Year started off with a roar as I could hear the wind howling outside early this morning. Most of Steelhead Alley’s anglers were either nursing hangovers or pulled the covers over their heads as they heard the wind outside. The weather forecast for the morning was calling for snow and winds gusting from 25 to 40mph. This was perfect weather for the diehard steelheader. When it’s very windy I usually take the spinning reel. But the spinning reel’s bail was broken so I had to use the pin. The wind was coming out of the southwest so I fished areas near cliffs and ravines. Unfortunately, I couldn’t escape the wind and it played havoc with my drifts and the line kept blowing off the reel. There was a pause in the gusting winds that I was able to get off several long drifts. But strong winds and Siglon F line don’t mix as I had the line blow off the water many times. The Rock was in perfect condition and I fished the lower section as the high cliffs blocked the wind and made it more bearable. The fishing was slow as I picked up a couple of fish here and there. But those few fish display a lot of vigor and it’s still exciting seeing that flash of silver streaking along the shore. After four hours I decided to call it a day as my hands were frozen. 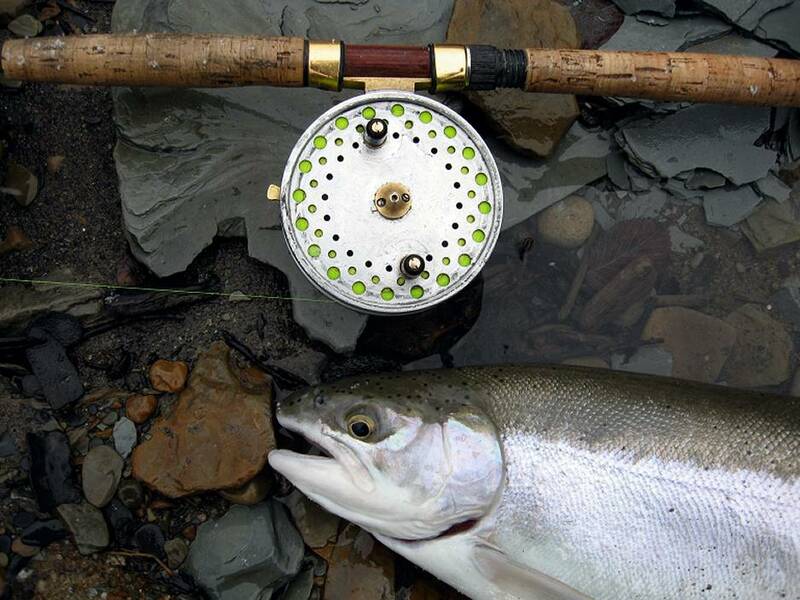 The Manistee strain is well adapted for cold water. 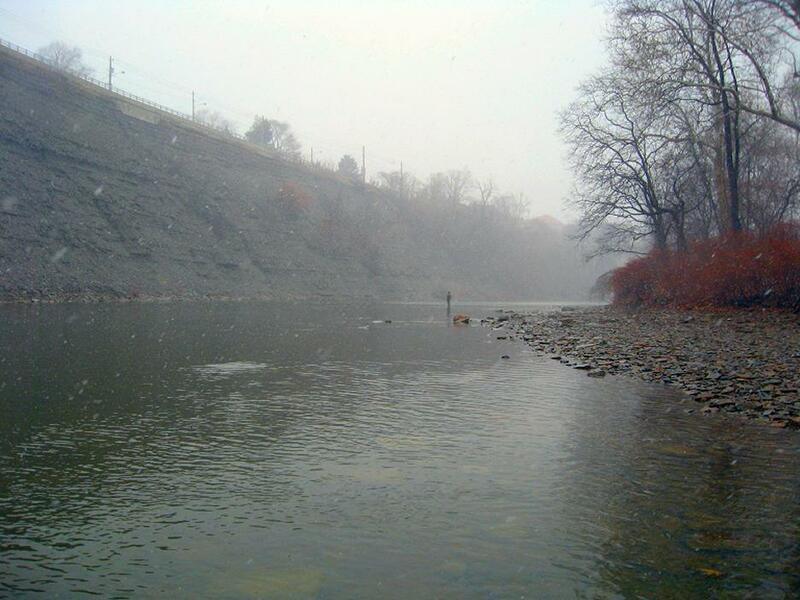 Even when the water temperature is in the low 30s, these fish will fight hard and even jump from the water. I had one large hen that kept bolting for the faster water. The key to catching them is where they stay during the winter. 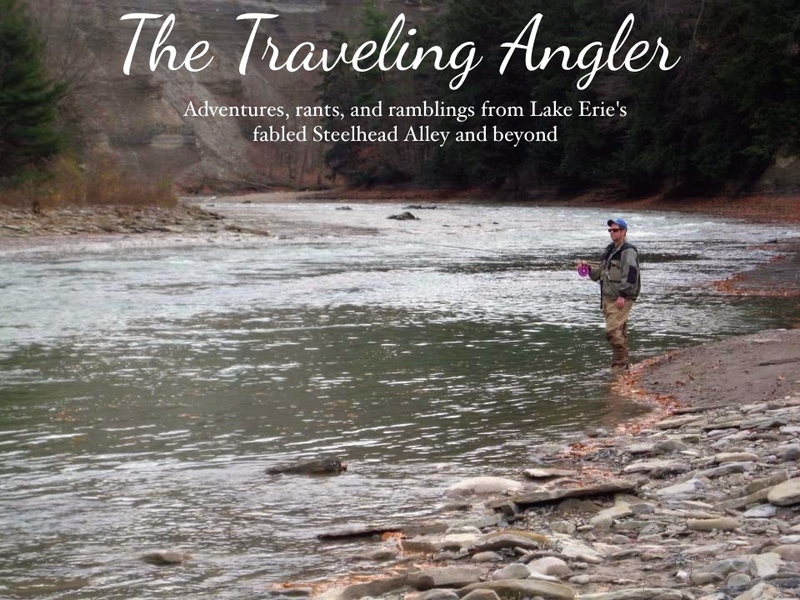 During the winter months steelhead will hold in the slowest moving sections of a river – eddies, tail end of pools, flats and along the banks. This is where the centerpin excels as the presentation can be slowed down to allow the fish to smell and see the bait or fly a little longer. The weather will be on a roller coaster this week. A cold snap will be hanging around the area for a couple of days and then by the end of the weekend the temperature will go into the 40s. I’m raring to go on the Grand this weekend as it’s almost a month and half since it last fished. What???? The Grand is Fishing?!? !